We had a great Friday at the gardens with excellent work by our grounds staff of Cindy, Big John, Terry, Trevor and Nolan. Our volunteers included Kay, Kathy P., Eva, Firefighter Kathy, Bill O., Dr. Gredler, Larry O., Stan, Kristin, Jenny, Marv B., Peg, Lois, Ellie, Pat, Gary, Patrea and others. 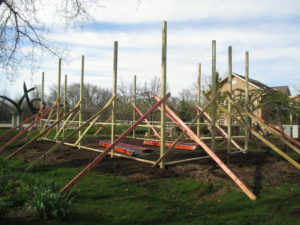 Much of my work involved getting ready for our sixth of six Volunteer Planting Work Days (8 am – 12 noon). 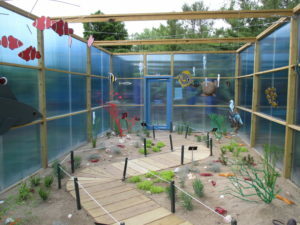 My brevity with the description of the day (which was very productive) is due to the fact I’d like to share our Giant Aquarium which is open for business! 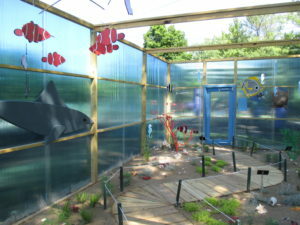 This structure is meant to be an imaginative space that visitors (of all ages) will enter and feel like they are underwater. 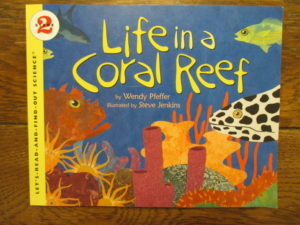 We are working with the Hedberg Public Library (Janesville, WI) on interpreting the book Life in a Coral Reef by Wendy Pfeffer (see below). 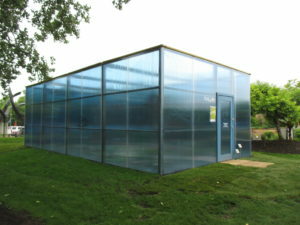 This unique space is 16′ wide, 32′ long and 10′ high and surrounded by blue plastic sheeting to look like water (from inside and outside). If this structure could hold water, it would take 38,300 gallons to fill it up! 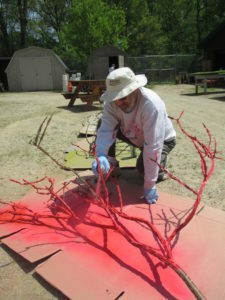 The photos in this blog show some of the progress with this project which would never have been done without the major help of Maury Frey. He is an excellent volunteer and top notch human being as well. We also had significant support from Joe Stadelman at Angus-Young Associates (construction drawings), JP Cullen (construction and framing materials), Gallina USA (awesome deal on the plastic) and Dr. Robert Yahr (founder of RBG, monetary donation). 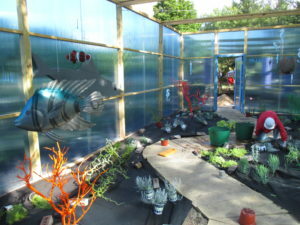 There were so many other staff and volunteers involved with this project and the teamwork has been exceptional. 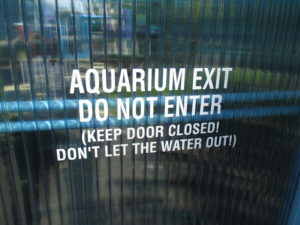 How did this Giant Aquarium come about? 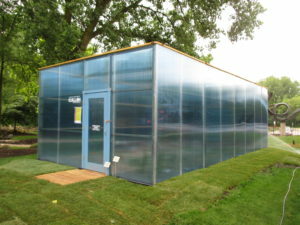 Over 10 years ago I was visiting the Green Bay Botanical Garden (excellent by the way!) 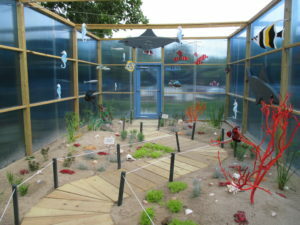 and in their Children’s Garden, they had a little space with sand, a couple of plants and some plastic fish dangling above the space on fishing line. 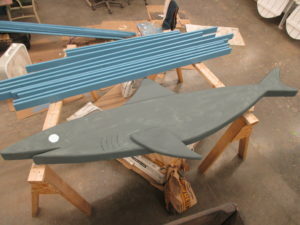 I thought that looked pretty cool and have wanted to do something similar but on a grander scale. 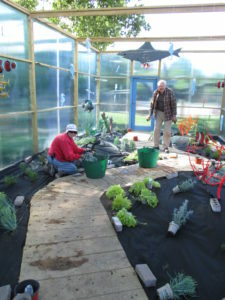 The aquarium idea has been fermenting for a couple years and we decided to go for it this past winter and despite some minor setbacks, the progress has been exceptional and everything has ultimately fallen in to place thanks to great support and “buy in” from so many people. 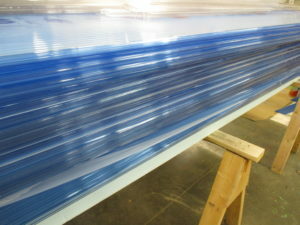 Why build a big blue box you might ask? Well…why not? We hope to have this structure up for over 2 years and feel that this installation will not only attract visitors (potentially new to the gardens) but also educate and inspire. Our StoryWalk program with the Hedberg Library has been wildly successful and we hope to encourage reading and educate visitors about aquatic environments and the coral reef specifically. 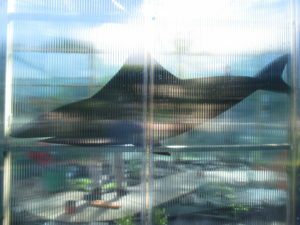 With education as the primary portion of our mission, I feel the Giant Aquarium will be a great tool to promote that mission. What’s inside? 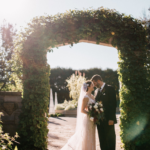 Well….come and take a look! 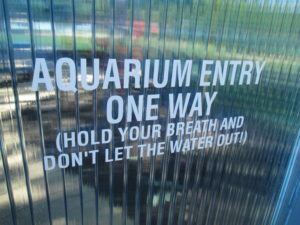 The flow through this aquarium is one way with both an entry and exit door. 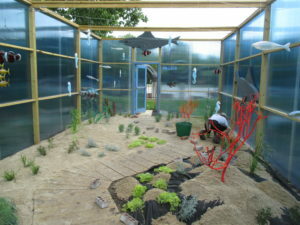 A boardwalk guides visitors along the sandy sea floor that is punctuated with “coral” and other aquatic-looking plants (live). Two sharks, a sea turtle, octopus and many fish are swimming about with crabs and lobster on the bottom. 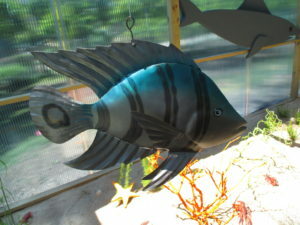 We have many awesome sea shells (donated by volunteers) for decoration as well. I don’t want to give too much away but do come and check it out. 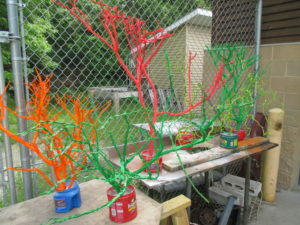 As the plants fill out, the “underwater experience” will continue to be more rich. A cottonwood (Populus deltoides) overhead provides dappled light which adds to the experience as well. 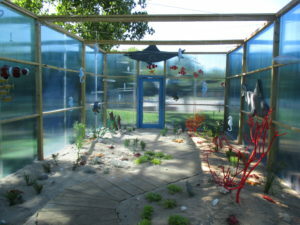 The book will be available to borrow in a “Little Library” (decorated with shells) outside the structure for perusal before (or during) enjoying the Giant Aquarium. We’ll also have the book available for sale in our Cottage Garden Gallery. 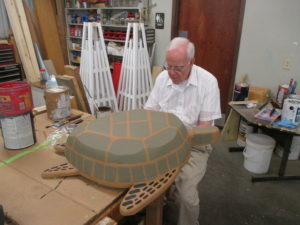 this awesome sea turtle (made by Dave T. above) is made of foam! 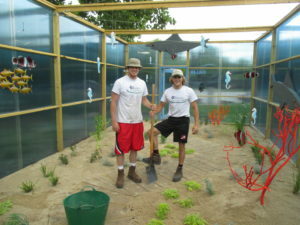 Trevor (left) and Nolan brought in over 2,000 lbs. 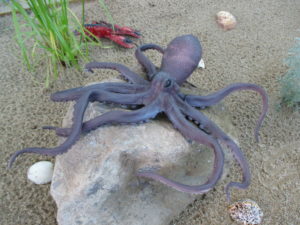 of sand for the sea floor! 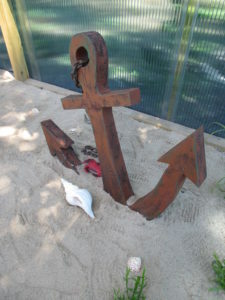 Vern made this awesome anchor out of foam! Thanks again to all of our donors, sponsors, staff and volunteers involved with this fun installation!! !